MISSION BAY — Four boats docked at slips at Mission Bay Yacht Club were lost to a fire that was reported at 9 p.m. March 19, and three other vessels sustained damage in the blaze. The fire reportedly started on one of the boats plugged into shore power, and by the time San Diego Fire Rescue personnel arrived on the scene, three boats were already engulfed in flames. According to fire investigators, the blaze began aboard the 36-foot Uniflite cabin cruiser Sea Passion docked at Mission Bay YC’s marina at 1220 El Carmel Place in Sail Bay. Investigators said the fire was the result of a possible electrical problem in a belowdecks refrigerator. The report was called in by the department’s helicopter unit, which noticed the blaze while on another call in the harbor. The Mission Bay Lifeguards Boating Safety Unit was called to the scene, and both fireboats — Marine 1 and Marine 2 — were used to fight the flames. The fire took 45 minutes to subdue. During the fire, one of the fireboats broke down and had to be towed back to the dock. According to Mission Bay YC marina manager Jason Proctor, the three other boats destroyed in the blaze included a Jersey 42-footer named Cinsarlis, a Chris-Craft 35-foot vessel named Fishhook and a 25-foot Catalina sailboat. Damage to the marina was also reported, with one dock and two fingers needing to be replaced. The total estimated damage from the blaze is expected to reach $1.3 million. San Diego Fire Rescue spokesman Maurice Luque said that no criminal activity was suspected. In total, six fire engines and three trucks responded to the call, along with the two Lifeguard fireboats. Ed Harris, a spokesman for the lifeguards’ union (Teamsters Local 911), said the fireboat’s breakdown brings public awareness to Mission Bay’s relatively “low level” of on-water protection, and the increasing need to ease budget constraints on the Lifeguards Boating Safety Unit. Lately, the issue has been of concern to San Diego city officials, as well. The San Diego City Council’s Public Safety and Neighborhood Services Committee formed a working group to look at where new funding from the city’s $16.5 million budget surplus could be utilized most effectively and in a timely manner. During the meeting, Mission Bay Lifeguard representatives stated that the group has been underfunded and understaffed for years, which has led to a near-breaking point for some areas of the department. Mission Bay Lifeguards act as the area’s lifesaving, firefighting public safety and law enforcement team. The unit has been stretched since 2009, when the San Diego Police Department — which had a small harbor unit on Mission Bay — had to scale back, essentially eliminating its operation on Mission Bay due to budget constraints. 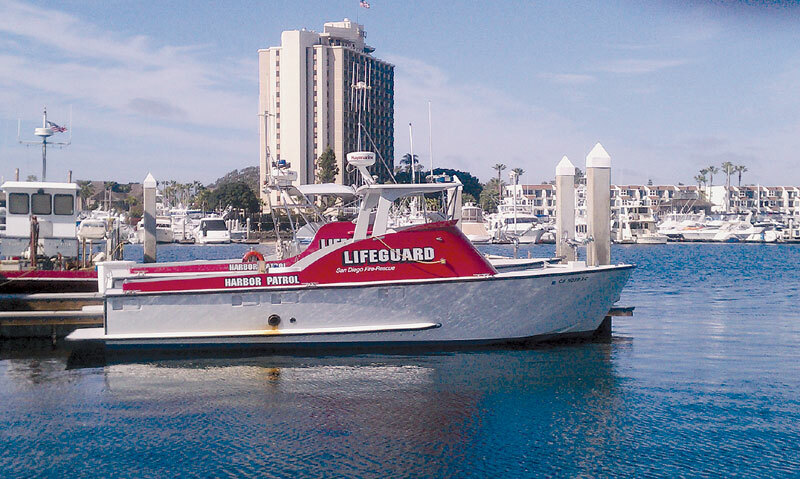 As the sole firefighting unit on Mission Bay’s 4,600 acres and 27 miles of shoreline, the Lifeguard Boating Safety Unit is equipped with an 11-boat fleet, two of which include firefighting capabilities. Marine 1 is eight years into its expected 25-year “life expectancy,” but is in need of engine replacement; and Marine 2 is 24 years into its 25-year life cycle. Wurts concluded his report to the Public Safety Subcommittee March 14 with a plea to get the funds necessary to replace the oldest fireboat and develop a funding plan that includes a regular Lifeguard fleet replacement timeline. Chester Mortisini, president of the Mission Bay Lifeguards’ union, added that staffing for lifeguards should be examined, as well as the department’s over-reliance on overtime and minimal nighttime staffing units, which he said could lead to an increase in injuries. “I’m not going to go so far as to say Mission Bay is unsafe, because I think we’re still staffed enough to respond to certain things, but we’re not responding with the level of safety and the level of response that the community believes we have, and it’s getting worse by the day,” Mortisini said. San Diego City Council members have supported funding fireboat replacement and increased staffing — but exactly what staffing elements need to be met, and in what order they should be addressed, remained to be identified. “We know there are needs, but we don’t really know what they are, and it’s hard to decide what should be funded and what shouldn’t,” said City Councilman David Alvarez. At the end of the meeting, the subcommittee agreed to create an action plan. Once completed, the plan would be presented to the entire city council, setting priorities and a timetable for getting necessary resources to Lifeguard Services.